"Tardies have decreased, last year averaging 140 per day, to 80 per day (43 percent reduction). 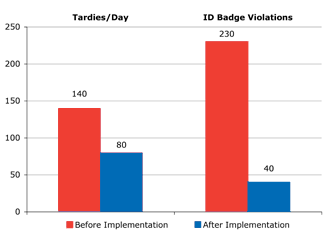 In addition, students not meeting expectations of the mandatory identification badges have decreased from an average of 230 in November to 40 in March (83 percent increase in compliance)." 65% of students qualify for the Free/Reduced Lunch Program. Over the course of one year with START on Time! students at Jordan High School have reduced tardies and increased levels of compliance!